Cathode Ray Tube: BOOK COMPETITION: Tales of Trenzalore, Harvest of Time, Summer Falls bundle up for grabs! 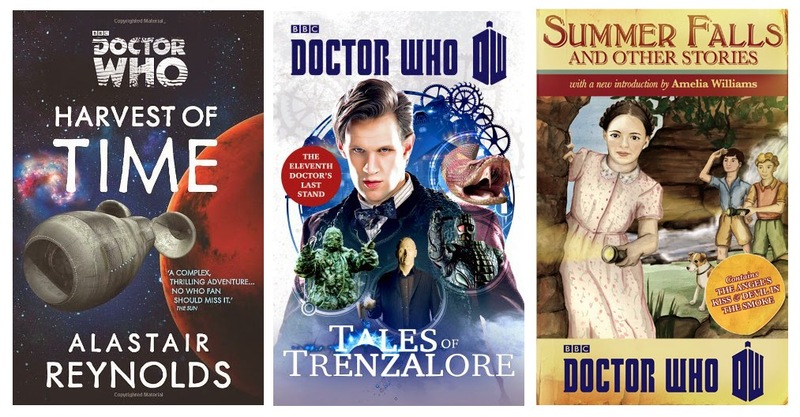 BOOK COMPETITION: Tales of Trenzalore, Harvest of Time, Summer Falls bundle up for grabs! Not allowing the dust to settle, let's get on with our next competition. A bundle of three books, again courtesy of our friends at BBC Books and Ebury Press. A forgotten enemy. An old adversary. A terrible alliance. On Earth, UNIT is called in to examine a mysterious incident on a North Sea drilling platform. They've hardly begun, though, when something even stranger takes hold: The Brigadier and others are starting to forget about UNIT's highest-profile prisoner. Some of what happened during those terrible years on Trenzalore is well documented. But most of it remains shrouded in mystery and darkness. This is a glimpse of just some of the terrors the people faced, the monstrous threats the Doctor defeated. These are the tales of the monsters who found themselves afraid - and of the one man who was not. Let it Snow is penned by Justin Richards, and features the Ice Warriors. Richards is a celebrated writer and Creative Cosultant to the BBC Books range of Doctor Who books. The Krynoid returns in An Apple a Day by George Mann, author of the Newbury & Hobbes steampunk mystery series, as well as numerous other novels, short stories and original audiobooks. Strangers in the Outland by Paul Finch sees the return of the Autons. Paul Finch has previously written for TV crime drama The Bill, and has written two Doctor Who audio dramas for Big Finish - Leviathan and Sentinels of the New Dawn. And finally, evil mind-parasite the Mara reappears in The Dreaming by Mark Morris. Morris has published sixteen novels, among which are Stitch, The Immaculate, The Secret of Anatomy, Fiddleback, The Deluge and four books in the Doctor Who range. In the seaside village of Watchcombe, young Kate is determined to make the most of her last week of summer holiday. But when she discovers a mysterious painting entitled 'The Lord of Winter' in a charity shop, it leads her on an adventure she never could have planned. The painting is a puzzle - and with the help of some bizarre new acquaintances, she plans on solving it. Detective Melody Malone has an unexpected caller: movie star Rock Railton thinks someone is out to kill him - and when he mentions the 'kiss of the Angel', she takes the case. At the press party for Railton's latest movie, studio owner Max Kliener invites Melody to become their next star. But the cost of fame, she'll soon discover, is greater than anyone could possibly imagine. On a cold day in December, two young boys, tired of sweeping snow from the workhouse yard, decide to build a snowman - and are confronted with a strange and grisly mystery. In horrified fascination, they watch as their snowman begins to bleed... The search for answers to this impossible event will plunge Harry into the most hazardous - and exhilarating - adventure of his life. Cathode Ray Tube has one set of three paperbacks, Harvest of Time, Tales of Trenzalore and Summer Falls, to give away to one lucky winner courtesy of BBC Books and Ebury Publishing. Simply answer the question below and submit your entry via email. - This competition is open to residents of the UK only but not to employees of BBC Books and Ebury Publishing or their agents. - Entries must be received by midnight GMT on Wednesday 20 August 2014. - Only one entry per visitor per day. No multiple entries allowed. Entries sent using answers posted on competition websites will be deemed void. We know who you are! - The winner will be the first entry with the correct answer drawn at random. - The winner will be contacted by email. The books will be posted one week after the competition closes (unless delayed by postal strikes). - By entering the free prize draw, entrants agree to be bound by any other requirements set out on this website. Entry is via email to frank_c_collins@hotmail.com. No responsibility can be accepted for entries not received, only partially received or delayed for whatever reason. Paper entries are not valid. Question: What is the date of Amy and Rory's wedding?